being able to post about photography like noah wilson's is the best part about having this blog because now when i want to tell everyone i know that i found a great new photographer, i can. wilson's images remind me of robert parke harrison's, only wilson's work is less narrative than harrison's and much more formally composed, probably on account of the square format and the decreased emphasis on a main character. 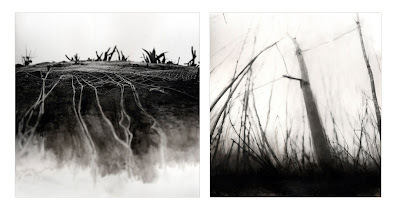 i love that the roots in the image on the left look like they are melting off the page into the earth, while the trees in the right image seem to grow from some dark abyss into an oblivion of white fog. i can only imagine how beautiful his hand toned, hand bleached, gelatin silver prints are. especially since in this increasingly digital age, gelatin silver prints have become quite a rare breed (sugimoto, a silver printing god, recently switched over to digital effectively solidifying the traditional silver print's new postion in the catagory of 'alternative process'). i found the above images on wilson's flickr page, but he also has a really nice website if you want to see more (i know you do alissa).